At Proof Strategies, our employees value giving back to our local community. We understand the importance of supporting those who strive to make a difference and are always looking for ways to help them succeed. So much so, it’s in our company’s ethos to work with clients who do good. That’s why we support Inner City-Inner Child (ICIC), a D.C.-based nonprofit committed to improving the quality of early childhood education for children ages 0 to 5 living in Washington, D.C.’s most economically disadvantaged communities. Inner City-Inner Child has been providing quality arts education and early childhood development programs to communities in Washington, D.C. for more than two decades. ICIC programs create environments that support school readiness for the neediest preschool children by introducing children and teachers to the power of the arts with academics. By bringing this program to inner city child care centers, ICIC also helps these centers become nationally accredited, and stay accredited by the National Association for the Accreditation Education of Young Children (NAEYC). In fiscal year 2018, ICIC served 4,162 low-income preschool children, trained 215 early childhood educators and donated 3,842 books to children in need. We’ve provided this incredible organization with year-round pro bono work since 2016, including specific initiatives to support ICIC’s Giving Tuesday campaigns. This year’s “Fill Our Cubbies” campaign aims to collect $2,500, enough money to provide 100 students with backpacks full of books. A $25 donation is equivalent to contributing one backpack to a child in need. Last year, Proof assisted in ICIC’s “Fill the Shelf” campaign to improve education opportunities for D.C.’s youngest learners and helped the organization exceed their goal of $5,000. They collected enough money to fill more than 10 preschool classrooms with books! 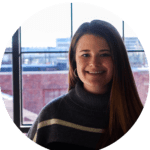 Additionally, the campaign was successful at raising the organization’s online profile, increasing website visits last November by 249 percent! Today on Giving Tuesday, we encourage you to be part of this amazing effort! 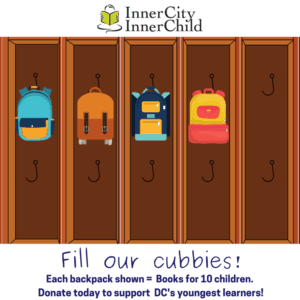 To learn more and donate to Inner City Inner Child’s Fill Our Cubbies campaign, visit https://bit.ly/2P6yPB4.